I would always see her walking on Campus looking so beautiful. One day, I got the courage to ask her out on a date, she said yes, and we have been inseparable every since. In the morning between classes, we would always go to Dairy Queen for Breakfast. This was the time we bonded and fell in love. We also enjoyed bowling together. 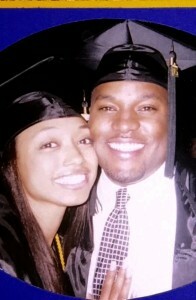 We were on homecoming court together in 2005 and we graduated in 2005 with our BBA beside each other. All of our memories on SAU campus were great because this is where #teamclark began.